1 Indiana, Marriage Certificates, 1958-2005, Marriage certificate for Michael Richard Pence and Karen Sue Whitaker, Ancestry.com (Online Database). 2 The Indianapolis Star (Indianapolis, Indiana), 09 JUN 1985, p. 131, Wedding announcement for Michael R Pence and Karen Sue Whitaker, Newspapers.com (Digital Library), www.newspapers.com. 3 The Indianapolis Star (Indianapolis, Indiana), 15 APR 1988, p. 45, Obituary for father Edward J Pence, Newspapers.com (Digital Library), www.newspapers.com. 4 United States Public Records, 1970-2009, Record for Michael R Pence, FamilySearch.org (Online Database). 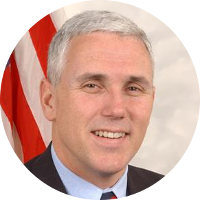 5 Wikipedia, "Mike Pence", (accessed 07/16/2016).